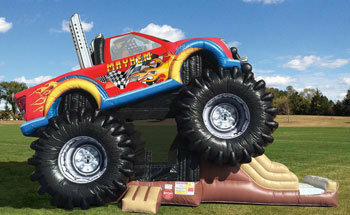 Monster Truck Combo Rental | ThePGGames.com Deerfield IL. The Monster Truck Bounce is a WOW unit that should be featured at an event near you for clients looking to set their events apart. Perfect for Touch a Truck, Big Trucks, and high impact events. This is a super realistic bouncer and combo slide which will take your event to the next level.